AQUADROP is a thin black dripperline with a blue stripe, equipped with flat drippers, welded inside at pre-ordered, constant spacing. AQUADROP is the ideal solution for irrigation into open field or greenhouse of a variety of cultivation of horticultural plants and floriculture (like watermelons, melons, strawberries, zucchini, peppers, aubergines, potatoes, cucumbers, onions, gerberas, roses, carnations, etc. ), gardens, hedges and terraces. 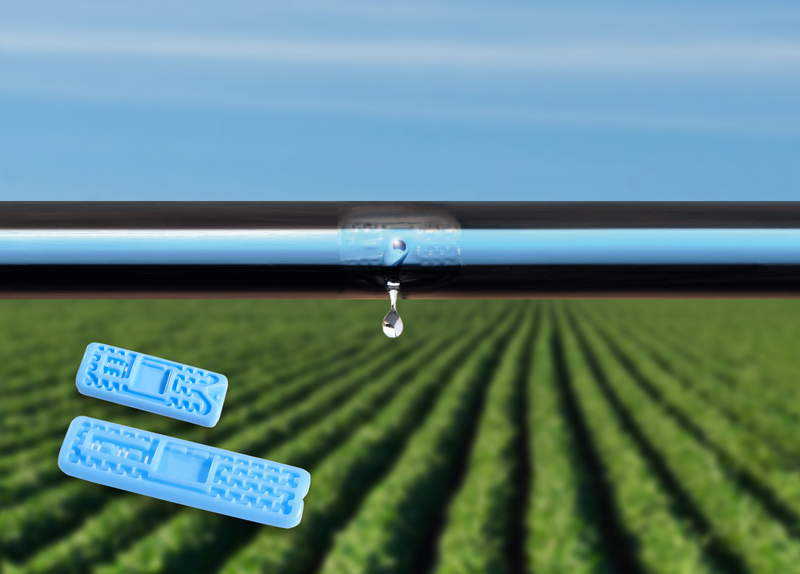 The new and innovative dripper has been studied with a double protection system to guarantee a high resistance to clogging. The active system blocks suspended particles in the water, while the turbulent flux reduces the accumulation of deposits inside the dripper's labyrinth. The wide range of models makes AQUADROP a versatile and practical product also for the installation of DIY irrigation systems (BRICO AQUADROP). UV-resistant drip lines to the attack of micro-organisms and moulds, saline water, acids or alkaline solutions normally used in agriculture. Internal Filters prevent particles from entering the drip labirynth. Blue Stripe upward shows correct laying on the ground.